Bubbles, Buttons and Bows: Bewildered! At Crafts Galore Encore our Challenge for April is sponsored by A Day for Daisies who produce the most AMAZING images! I chose Bewildered, (which I am most of the time!) as I simply love her face and hair. 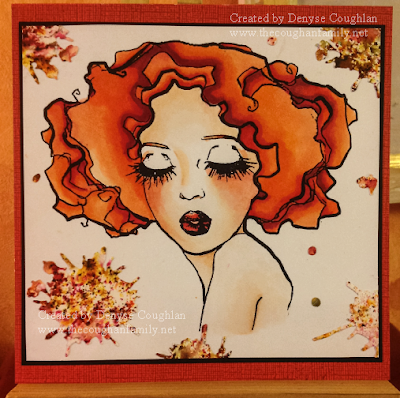 When I saw the image I decided she needed to be a redhead and coloured her using my Copic pens. For my background splots I used Paperartsy Infusions on watercolour paper which I die cut. I then gave the image a simple, single layered mount. Wow this looks just amazing. Gorgeous work. Love it. Thank you for sharing with us over here at Classic Design Team Open Challenge and best of luck with your entry. Beautiful card. Thank you for joining us at Creative Craft Cottage challenge. Succes have a nice day. This is a beautifully coloured and designed card. I'm sorry you've had trouble linking it to our challenge, but don't worry it will be included in the random prize draw as well as being judged for Top 3. I have made the appropriate DT member aware of your entry. Stunning card, great image and beautiful colouring. Wow DeBe this is just so beautiful coloured. Love the autumn hues. A Decoart Tray to Brighten Your Day!